With the Guard Rail Base GB, the guard rail can be secured without penetrating the roof. In between, are the custom-fit drainage and water storage elements. 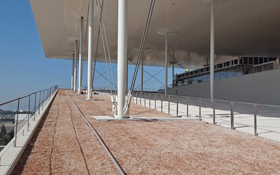 The new Stavros Niarchos Foundation Cultural Center (SNFCC) is a symbol of education, culture and sustainability, both for the people of Greece and in the wider international context. This project was awarded LEED Platinum Certification and is the largest construction project in recent Greek history. The buildings house the Greek National Opera (NGO) and the National Library of Greece (NLG) and are literally embedded in the open park that stretches over an area of 17 hectares. 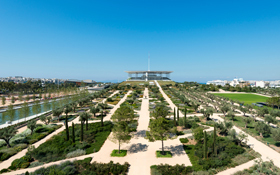 The Stavros Niarchos Park with its olive trees and lush mediterranean vegetation, slopes upwards from ground level to a height of 32 m at the roofs of the buildings. 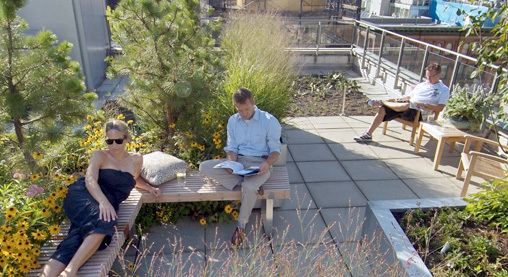 A roof area of approx. 25,550 m² has been completely greened with ZinCo systems and from this altitude, visitors have a stunning view of the nearby Mediterranean Sea. 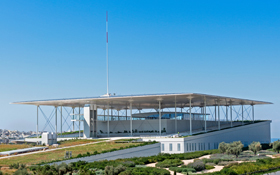 SNFCC stands for Stavros Niarchos Foundation Cultural Center and is a gift from the Stavros Niarchos Foundation to the Greek state. The foundation stems from the estate of the eponymous shipping magnate and art collector and invests in philanthropic projects around the world. 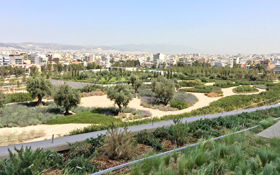 The SNFCC had already been planned before the major financial crisis in Greece and it is a project with which the foundation now wishes to specifically counteract the consequences of that crisis. 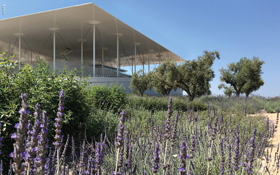 The Cultural Center is 4 km south of the centre of Athens, on Faleron Bay in Kallithea. 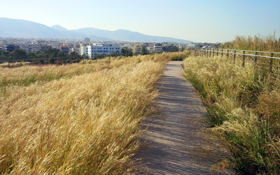 Kallithea was one of the earliest seaports in Athens and today is the most densely populated municipality in Greece. The 23 hectare site beside the sea used to be a racecourse and it was used as a car park during the Olympic Games of 2004. The new park now provides valuable green space in this sea of houses and, thanks to its architecture, has created a new link to the sea, passing over the motorway along the seafront. 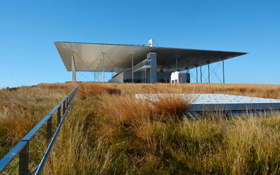 The concept of world-renowned architect, Renzo Piano, who has put his own mark on the project, was to “create a visual and physical connection with the water”. A greened bridge creates a pathway from the seafront to the Cultural Center. In addition to this “Esplanade”, an artificial water channel also provides a physical connection to the water. The purposeful slope of the ground up to an altitude of 32 m provides the visual connection, an unobstructed view of the sea. 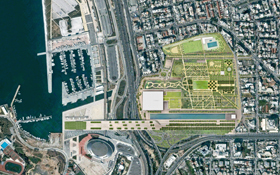 The rising parkland culminates in a roof terrace with a stairway, and a thin solar roof, 10,000 m² in size, drawn over it, which is referred to by Renzo Piano as the “flying carpet”. Due to thermal expansion, winds and the risk of earthquakes, this futuristic design is built on columns that have a shock-absorbing system, and its dimensions are a first worldwide. The solar roof has a capacity of 1.5 MW and provides valuable shade for visitors, who can enjoy the spectacular view of the city and of the Mediterranean from the roof terrace. The visitors to the “Lighthouse”, centred beneath the solar roof and with all round glazing, also have a 360° panorama view from this lofty location. The buildings have a total roof area of approx. 25,550 m² and due to the complete greening of the area, they merge into the parkland. This has the added benefit that the rooms are protected from solar radiation, with the result that the energy needed for air-conditioning is conserved. The Greek National Opera is situated beneath the roof terrace (approx. 6,950 m²) mentioned above, and has two multi-media concert halls that are state-of-the-art in terms of sound and stage technology. The lobby encompasses all six floors of the National Opera and the ground floor entrance is at the “Agora”, or forecourt, adjacent to the water channel. The entrance to the National Library of Greece is also within this forecourt, at the buildings’ recess. The National Library (approx. 6,150 m²) is designed as a transparent space that makes knowledge accessible to everyone. The use of computers, internet access and educational programmes are all free of charge for this reason. The complex also houses a car park with 1000 spaces (a roof area of approx. 8950 m²), which also merges into the lush greenery, as do the operations and waste management buildings (together approx. 1,700 m²) and the delivery entrance “buffer zone” (approx. 1,800 m²). The green roofing works were executed in an exemplary fashion and the efficient organisation and tidy construction site were evident. In all cases, a root-resistant bituminous waterproof membrane provided the basis for the concrete roofs with a pitch of up to 5°. However, different ZinCo system build-ups were then used, depending on the individual building. The Greek National Library and the Greek National Opera have inverted roofs and required diffusion permeable system build-ups. A system build-up with Stabilodrain® SD 30 was used for the Opera, as this is where the roof terrace was built, requiring primarily drainage and compressive strength. The first layer installed on the thermal insulation was the air and vapour permeable Separation Membrane TGV 21, the second consisted of the 1 × 2 m Stabilodrain® elements that act as lost formwork in the accessible area and finally the bright, seamless in-situ concrete layer. 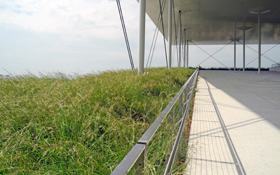 For the vegetation, mainly consisting of grasses, on the inverted green roofs of the Opera and the National Library, the Floradrain® system build-up was chosen in view of the high water storage capacity, a classic for semi-intensive greenroof. The Filter Sheet SF was installed onto the Floradrain® elements followed by about 15–18 cm of substrate that had been prepared locally by egreen, the ZinCo partner company in Greece. Stabilodrain® and Floradrain® enable drainage across the entire area, even beneath the pathways in heavy rainfall events. The ZinCo system build-up with Protectodrain® PD 250 was used on the non-insulated roof of the car park. This solid, heavy duty drainage element with high load-bearing capacity was the perfect solution providing excellent protection and drainage underneath the pathways and the high filling depths of the planted areas. 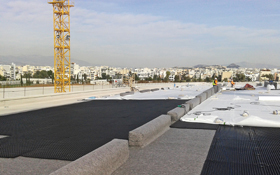 Once the Protectodrain® drainage element with its attached rubber protection mat was installed, the car park roof was accessible to construction vehicles. 40 cm of Zincolit® Plus were then spread over the stable Filter Sheet TG, followed by an additional 40 cm at least of Roof Garden substrate. The substrate depth beneath the olive trees can be up to 120 cm. Applying and distributing the huge quantities of substrate was relatively manageable, thanks to the use of turbo bags and wheel loaders. 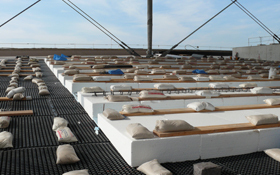 As the planned pathways had to be at the same level as the substrate surface, some light top-up material was required. Foam glass gravel was added up to a height of one meter under the stabilized ceramic soil pathways. 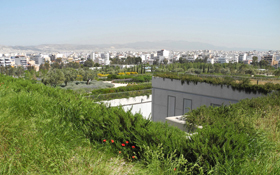 Due to the uniform mediterranean vegetation, the green roof merges seamlessly with the ground that slopes up to building level and that drops away evenly from this level. All in all, there were a respectable 17 hectares of public green space. Visitors will discover a fascinating and idyllic garden, a labyrinth, a sports area and fountains among the 1,450 new trees and 280,000 new shrubs. A drip irrigation system is used for the required irrigation for all the green areas. Given that the entire park slopes upwards, an impressive 1,070 metres of guard rails were required all round. Here too, ZinCo offered the best technical solution. The Guard Rail Base GB, a specially designed 1 × 2 m base with underlying reinforced profiles, is integrated into the green roof build-up and is kept in place by the weight of the terrace covering or the substrate. This ingenious system allows for the weight to be distributed across the entire area and does not require roof penetration, which helps to avoid weak points in the roof waterproof membrane and thermal bridges. The guard rails, designed by Renzo Piano himself, are then mounted onto the guard rail bases. Almost everywhere, the guard rails are placed further away from the roof edge, which is why most of the guard rail bases can be used in combination with the ZinCo fall-arrest system, Fallnet® Rail. Rail brackets and rails including moveable fixing devices are then mounted. A person can attach him/herself with their personal protection equipment and safely carry out maintenance work along the narrow strip beside the roof edge. Finally, guard rails were used not only for roofs but in areas of the park that are on the ground but where there is a sharp drop at the edge. In line with the architect’s and the landscape designers’ concept, the focal point was always a mediterranean hill with vegetation that at times grows out beyond the roof edge. Even the pathways in the park don’t go as far as the guard rails as the peripheral areas are purposely densely planted. 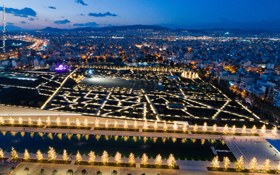 SNFCC is the first cultural project of such scale in Greece to be awarded Platinum LEED Certification (Leadership in Energy and Environmental Design). Even throughout Europe there has never been a project of such complexity that was awarded LEED certification. 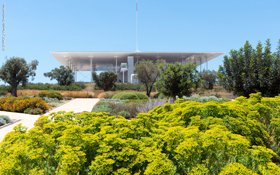 Athens and Greece have created a new institutional foundation with this Cultural Center from the Stavros Niarchos Foundation , which will consolidate them in the global context of the 21st Century. An internationally competitive National Opera and a National Library as a foundation for education and culture, directly on the sea and embedded in a unique parkland, offering a very special ambience with open-air concerts and outdoor events for up to 32,000 guests. SNFCC not only intends to create jobs and draw tourists, but overall to have a transforming impact – that is the wish going forward.